I have a raspberry pi compute module 3 on an I/O board in which gpio 12 is contolling the mode in ltc 2873. If it is ground it will be working in the RS 232 mode. so if I have to write something into it which port should I be using for the serial communication . should I be using tty1 that is the port for Uart R_X and UART t_x itself. 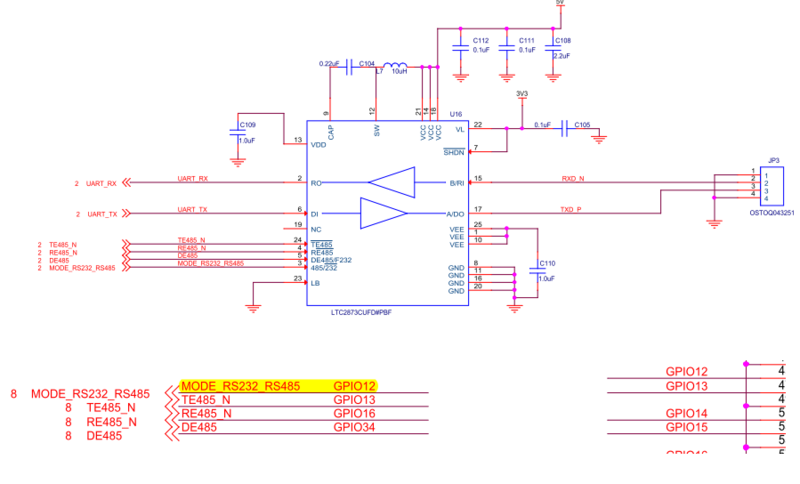 I am attaching the schematic along with this and I have to take the output from the JP3 section as in the schematic. Can someone pls help me figure it out. Browse other questions tagged pi-3 rpi.gpio serial-console readwrite compute-module-3 or ask your own question. How to free the UART pins of Raspberry pi B+ from acting as a kernel console? Lego EV3 infrared sensor to raspberry pi 3 direct connection via UART? Can I use the TX/RX pins and the USB ports for multiple serial devices? CM3 - How can I use USB_OTG on carrier board? How does this differ from CMIO board? How to login compute module via serial port? Why do the Z-fighters hide their power?